Studies of the rapid multi-clutch mating system of the Mountain Plover (Charadrius montanus) have suggested differences between male- and female-tended clutches in both nest and chick survival. One explanation for these differences may be differential maternal investment in the eggs laid in male-tended clutches. To explore possible differences we modeled the volume of plover eggs in male- and female-incubated clutches. In addition, the effects of day of nest initiation, year, and prairie dog colony were also included in the model. We measured 567 eggs from 194 nests of 131 females and 620 eggs from 213 nests of 148 males. Egg volume was calculated using the equation [(0.4482*Egg Length*Egg Width2) - 0.269]/1000. 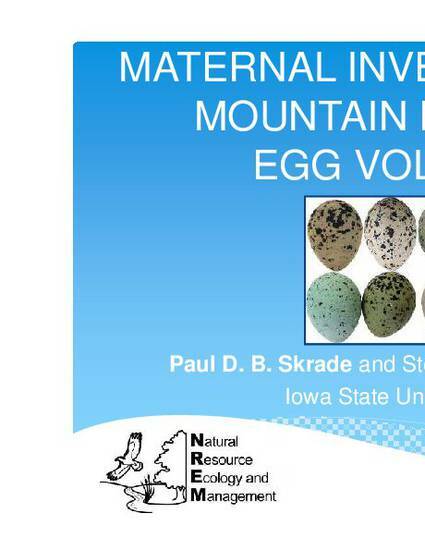 Male-incubated eggs tended to be larger than those of females (male volume = 13.20 cm3, SE = 0.03; female volume = 13.17 cm3, SE = 0.04) and this effect was strong (p = 0.04). Day of nest initiation was also significant (p = 0.02), with volume decreasing throughout the season. This study provides further information about parental investment in the uncommon mating system of a species of conservation concern.